The 270 Winchester is an excellent bolt action hunting rifle for taking down deer, hogs, or other smaller game. It will do fine up against an elk, but since it doesn’t have quite as much power as a 30-06, would probably be better suited as a more medium-range rifle, whereas a lot of the time, elk hunting is more of a distance hunt. What would be the best scope for a 270 Winchester? Stick around for this guide and check out our top five picks! A 270 Winchester is more of a medium-range rifle, so ideally you want a scope that will perform out to 800 or 1000-yards at least. A variable magnification power scope is probably the best option. 3-9x power would easily get you into that 1000-yard range and not be overpowering. 4-12x would also work well. Just remember that the best magnification setting is the lowest possible setting where you can clearly see the entire target view. There are several different reticle choices to choose from. Personally, I am partial to a four-plex reticle, but many would agree that a BDC is the way to go. Most BDC reticles perform optimally at a range out to about 300-yards, which is a great shooting distance for a 270 Winchester. The BDC would be beneficial in estimating bullet drop, as with drop for a 130-grain projectile you lose about 7 inches per 300-yards. First or second focal plane is a personal preference type thing. First focal plane is where the reticle size changes with magnification. So, as the image gets bigger or smaller, so does your aiming point. In a second focal plane reticle, the reticle stays a constant size. Only the target image changes with magnification. There are pros and cons to each. A first focal plane reticle could actually give you too big of an aiming point on higher magnification settings and block part of your image. On the other hand, a second focal plane aiming point could be washed out and become hard to see at higher magnifications. A good design is imperative to the durability of your scope. Ideally, you want to choose a body constructed of a single piece tube. Usually, this will help protect against shock and allow for the scope to be O-ring sealed and gas purged to keep moisture out. High-quality lenses with fully multi-coatings are desired for the best protection against water, fog, abrasion, glare, and reflection. Fully multi-coated lenses mean that every lens is multi-coated with these protective coatings, and ensures for the best protection. Longer eye relief is important for protecting your face against recoil. Turrets come in finger adjustable or not, and exposed or capped. These are your preference, you just want to be sure the adjustments are easy to use, easy to understand and are solid. Nikon delivers again! The Nikon Buckmaster II is a 3-9x40mm scope with an incredibly long-range “dead-on hold” BDC reticle with unique see-through ballistic circles for longer distance shots, and normal sight picture for shorter-range shots where the cross-hair would be your aiming point. Use this with Nikon’s Spot On Ballistic Match Technology and you’ve got a winning combination! The Buckmaster II offers a 100-yard parallax setting and a generous eye relief on fully multi-coated lenses for vivid pictures and optimum light transmission from dawn to dusk. It is rugged, being O-ring sealed and nitrogen purged, to deliver a completely waterproof, fog proof and shockproof performance. Not only is it a tough scope, but it also is backed by Nikon’s limited lifetime warranty and their no-fault repair or replacement policy. Most customers of this scope agree that it is an excellent scope for the price. The glass is clear and sharp and the magnification is easily adjustable. It is easy to zero and holds zero well. Many are pleased with the reliability of this scope. Complaints about this scope include problems getting it to sight in and possible faulty cross-hairs that disconnect or float. The Leupold VX-2 is a 4-12x40mm compact scope that is 100% waterproof and fog proof. It sports a duplex reticle with a versatile 3:1 zoom erector system that’s ideal for any shooting situation. The lenses of this scope are coated with a DiamondCoat lens coating on the exterior lens surfaces for a flawless sight picture and the ultimate protection against abrasions. The lens edges are also blackened to reduce light diffusion. This creates a brighter image with increased contrast as more usable light is able to reach the shooters eye. Leupold provides an exclusive Index Matched Lens System for exceptionally bright and extremely sharp resolution across the entire visual field. Other great features of this Leupold scope are the quick and easy parallax adjustment with the adjustable objective, a custom dial system, ¼ MOA precision finger click windage and elevation turrets, and Leupold’s full lifetime guarantee. Customers of this scope praise the high-quality construction and the excellent, clear glass. 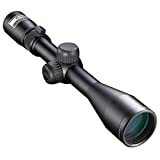 Others have expressed that this is one of the lightest scopes on the market and the best for the money. Most negative comments about this scope are inconsistent, but it seems that the scope does not actually come with the CDS dial system as advertised and must be retrofitted for it if you want it, which costs extra through the manufacturer. no CDS dial system as advertised. It costs extra for this. Lenses are fully multi-coated for crystal clear, bright images from dawn till dusk. The fast focus eyepiece allows for quick and easy reticle focusing. The Vortex Optics Diamondback is a tough second focal plane rifle scope made of a solid one-piece tube with a hard anodized finish. This makes the scope shockproof as well as allowing the shooter to stay camouflaged with the non-reflective matte coloration. This scope is also fog proof and waterproof with an O-ring seal and argon purged interior. The Diamondback features a dead-hold BDC reticle that’s good for shooting at varying ranges where estimating hold-over might be a concern. The crystal clear lenses are fully multi-coated and a fast-focus eyepiece allows for quick and easy reticle focusing. Other desirable features are the metal on metal precision turrets that offer the ability to zero reset after sighting in, and a precision glide erector system that ensures accurate tracking and repeatability. Most customers love this scope and exclaim that it is super clear, bright and well-made. They tend to really love the dead-hold BDC reticle and don’t have enough good things to say about the optical clarity. Complaints about this scope include that the eye relief is awful and that apparently the scope does not tolerate recoil very well. A few people have also reported that the reticle gets blurry. The Vortex Optics Crossfire II is a 3-9x40mm scope with a dead-hold BDC reticle, long eye relief and an ultra-forgiving eye box that allows you to quickly get your sight picture and acquire your target. You can quickly and easily focus the reticle with the fast-focus eyepiece. The construction is tough, made from a single piece tube of aircraft-grade aluminum to ensure strength and shockproof performance. It’s also O-ring sealed and nitrogen purged to deliver waterproof and fog proof performance. Capped reset turrets are finger adjustable with MOA clicks that can be reset to zero after sighting-in. The lenses are fully multi-coated and anti-reflective to provide a bright, clear view for the shooter. This is an excellent choice for a budget pick! Customers absolutely love this scope for the price! They have remarked that it is crystal clear all the way through magnification and that it zeroes in easily. However, there have been several complaints about this scope not being able to hold zero, having an unforgiving eye relief and having reticle problems where the reticle starts to spin. Others have complained about severe blurriness. The Bushnell Banner Dusk & Dawn is a low-light 4-12×40 rifle scope with dusk and dawn brightness multi-coated lenses for brightness and clarity in failing light conditions when big game are at the height of activity. It features a Multi-X reticle and ¼ MOA fingertip windage and elevation adjustments. This scope is 100% fog proof and waterproof and made from single tube construction. With a good, long 3.3-inches of eye relief and a fast-focus eyepiece, you’re sure to come out a winner this next hunting season! Customers of this scope are very happy with the quality and clarity that you get for the price. The accuracy is very precise and holds zero very well. On the other hand, some customers have stated the opposite, that it doesn’t hold zero well. There have been a few complaints that the reticle malfunctions and the scope is particularly heavy. Which is the best focal plane for my 270 Winchester?– This is personal preference. Many people like the second focal plane scopes as the reticle always stays a constant size, no matter what your magnification setting. A first focal plane reticle will change in size with magnification, magnifying both your target image and reticle simultaneously. The difference in construction is where the reticle is fixed within the scope. Situated near the ocular lens is the second focal plane, the first focal plane is situated near the objective lens. What is the best magnification setting? – The best magnification setting is the smallest magnification that allows for a clear view of your entire target image. There are a number if benefits to this. If you over-magnify you lose out on target acquisition, target surroundings, and situational changes, etc. The big one is that target acquisition. Live targets move and you must be able to track them. Hopefully, this guide has helped you draw some conclusions about what to look for in the best scope for a 270 Winchester. Maybe one of our top five picks will even become the exact scope you are looking for to be best buddies with your 270. Whichever scope you pick, just be sure to go with the one you know will perform to your standards and take down that monster buck you saw last season. Happy hunting! If you enjoyed this article you may also like our article on some of the best AR10 scopes or maybe scopes for a 243.